Hailing from Jacksonville, FL, many considered Black a can’t miss prospect. Rated as the #22 best player in the country and the #2 best WR according to ESPN, Black decided to team up with Amari Cooper (Raiders) and head to the University of Alabama to form a 1-2 WR punch for Nick Saban and the Crimson Tide. 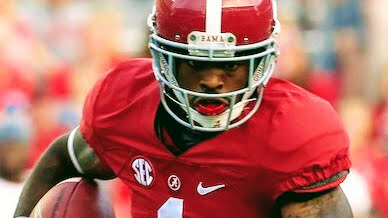 Unfortunately, injuries derailed Black’s Alabama career, limiting him to 25 receptions in three seasons. His best season with the Crimson Tide came his sophomore season, catching 15 balls for 188 yards (17.1 yards per catch) before injuries took their toll. Black decided to transfer to the University of Missouri during his final year of eligibility. In his lone season in black & gold, Black posted 17 catches for 257 yards and a TD, including 12 punt returns for 97 yards. Now fully healthy and extra motivated, Black garnered NFL attention after going undrafted, getting a tryout with the Philadelphia Eagles. Black will taking his explosive talents to The Spring League in 2018, looking to prove he deserves to suit up on Sundays like his pedigree suggests. It's time for this young man to shine and show his talent. 4 star player that almost every D1 school wanted coming out of high school. Very humble kid and he's definitely a Sunday man! Love to see him on the field. He was rated higher than a lot of other good receivers and I know he'll be very useful to any NFL team! This young man deserves to play on Sunday's. Chris has heart, determination & love for the game, unlike most guys who are looking for the fame and fortune....He truly would be a great team player.